The art world deals with fraud all the time, but those cases rarely involve artists lying about owning a replica of a famous work. 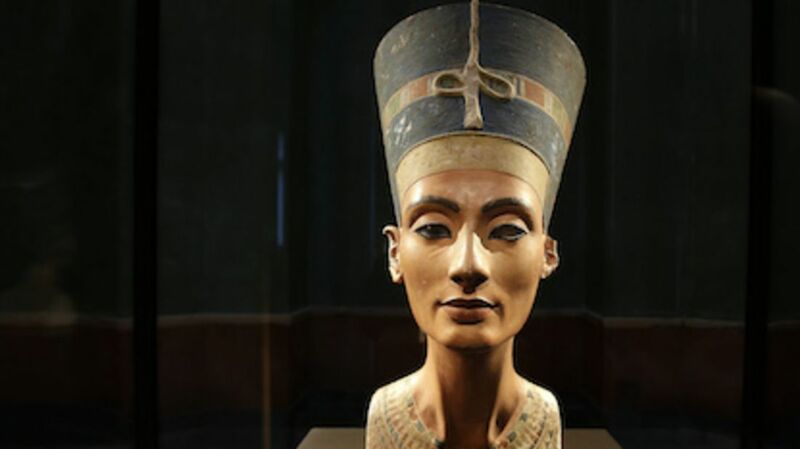 In a bizarre twist of events, Popular Science reports that the two German artists who claimed to surreptitiously scan the bust of Egyptian Queen Nefertiti in Berlin’s Neues Museum likely never copied the statue. Nora Al-Badri and Jan Nikolai Nelles said they'd smuggled Kinect scanners into the museum last October underneath their jackets and scarves. They claimed to have made a copy of the famous limestone and stucco statue, and later released the collected dataset online for anyone to download and print. Media outlets (including mental_floss) caught wind of their efforts and published a video of the two scanning the bust. However, Cosmo Wenman, an artist and 3D-scanning consultant, investigated the scan in a blog post, and noted that Kinect scanners produce lower-quality scans than the file the artists released for public download. He believes that the model they released was actually based on an already-existing bust of Nefertiti, which had been made for the museum by German scanning company TrigonArt. “In my opinion, it’s highly unlikely that two independent scans of the bust would match so closely," Wenman wrote. "It seems even less likely that a scan of a replica would be such a close match. I believe the model that the artists released was in fact derived from the Neues Museum’s own scan." Since the scan has never been released to the public, Wenman says that the anonymous third-party collaborator who allegedly processed the scan for the artists may have played a part in the con.